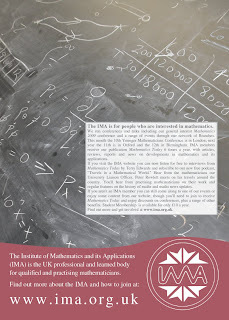 I am delighted to report that the IMA and the National STEM Centre have made all twelve issues of iSquared Magazine available as PDFs for free download for the first time. The magazine was produced as a print-only publication by Sarah Shepherd from 2007-10. The last two blog posts have attempted to catch up this blog on October and November. This post will be an attempt to bring December up to date. I started the month by giving a lecture at Nottingham on subsitution ciphers for the History of maths and x and recording this using the in-room capture system. This is by no means the best recording I have ever seen but it is a rough and ready approach which involves no cost (to me for the recording – obviously the kit cost money to set up). The talk was advertised through the Nottingham Mathsoc and I was nervous about the number that would turn up. I didn’t want very many – although I have spoken to fairly large audiences I am not accustomed to being recorded speaking and this added to my nerves – but I wanted the number to be greater than zero so I had an audience to judge my timings against and react to. Anyway, the recording seemed to go well and the result is available to view on this blog and elsewhere. The next day I began a trip along the south coast. I started by going to Brighton to give my careers talk. This went well and I headed to Portsmouth to set up camp. The following day I was the opening speaker at a Portsmouth careers day and this went well, then I headed to Surrey to meet the new student society there over lunch. I returned in the late afternoon to Portsmouth to watch some alumni give talks (look out for a couple of upcoming podcast episodes). It seems the student maths society at Portsmouth is called Portsmath and the membership fee is £3.14, which I found pleasantly geeky. Finally, in the evening, I headed to Southampton and gave my cryptography talk – the first pop maths talk put on by a usually more party-oriented society there. The following week I took a trip to the South West. In Exeter I stayed in a hotel with a giant Christmas tree outside my window, it being nearly Christmas. I went to Exeter university to hold a careers stall and give my careers talk. Unfortunately the stall was fairly poorly attended – I think I saw 13 maths students in twos and threes over a 2 hour period – and my talk broke a new record for size of audience with only 2 students in attendance. The talk went well anyway and I was reminded it is quality, not quantity, but being so far from home I felt like I was experiencing very inefficient use of my time. The following day I went to Plymouth and was well looked after while I gave my final careers talk of the year to a nice response. In preparing my 6-monthly report for the IMA I realised that in the nine week period 7 Oct-10 Dec 2009 just over 1100 people had seen me give 32 talks at 28 universities and 150 have spoken to me at 3 universities when I have operated careers stalls. This feels very pleasing. At the end of the year my 6-month IMA review and annual appraisal both went well, I received my copy of iSquared issue 10 containing my article “Ciphers through the ages” (to accompany my History of maths and x video on the same topic) just before Christmas and the podcast was on its half century episode with Sebastien Guenneau on invisibility cloaks. So it is we move into 2010 (or is it MMX?) hoping the blog will keep proper time this year and not need periodic catching up! Thursday was Glasgow day in my Scottish tour. I started the day by travelling to Glasgow. The picture below is of George Square which is very impressive but somewhat affected by the rain. I have received mixed opinions of the rain in Glasgow with some people telling me it rains at least every other day and others telling me it is mostly sunny. On my day there it was grey and rainy. 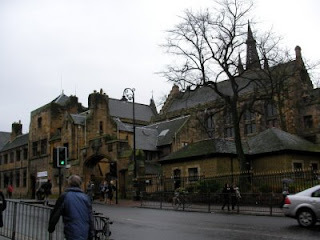 The picture below is of the main gate at the University of Glasgow, which is not where I gave my talk. In the maths building I passed a pleasant hour with Professor David Fearn discussing my work for the IMA and the proposed merger with the LMS. Professor Nick Hill took me to lunch and for a tour of campus including the houses where once the 12 university professors lived, including at one time Lord Kelvin, and the River Kelvin from which his title was derived. After this, Professor Peter Kropholler hosted me for my careers talk to what turned out to be a surprisingly small group of students. The talk went well and felt nicely intimate but it was a shame not to have seem more students. Next I travelled to the University of Strathclyde. My talk was in the Livingstone Tower and there is a picture of a statue of David Livingstone below. I met with Professor Iain Stewart who organised my talk which I gave to a reasonably large crowd and it seemed to go well. After my talk in the staff room at Strathclyde I took the following snap. 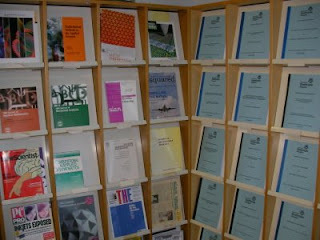 I was pleased to see iSquared among the available publications. In the course of my careers talk I always ask students if they read iSquared and Plus magazines. Not many do, actually, so perhaps these need greater promotion. I think both give a good idea of the range of career options and areas of work open to maths graduates that they are not necessarily aware of otherwise. iSquared is a quarterly magazine which sheds light on the growing number of real-world applications of mathematics. In iSquared magazine you can read a wide variety of articles about how maths is used in the modern world and keep updated on the latest developments at the forefront of mathematical research. You can also read reviews of recently released books on mathematical topics, biographies of celebrated mathematicians and interviews with people for whom mathematics is a crucial element of their work. You can subscribe to iSquared magazine for just £11.20 or buy a single issue for £3.15. For further information please visit www.isquaredmagazine.co.uk, where you can either purchase the magazine online or download a subscription form. Alternatively, to have a subscription form posted to you, please email your name and address to subscriptions@isquaredmagazine.co.uk. I would be grateful if you could pass this information on to any friends or colleagues who might be interested in iSquared magazine. I have designed adverts to go on the back cover of iSquared Magazine over 4 issues. Each highlights an aspect of IMA membership and will provide a regular income to support iSquared, something the IMA are keen to do. The first was in the autumn and you can view it on this blog. 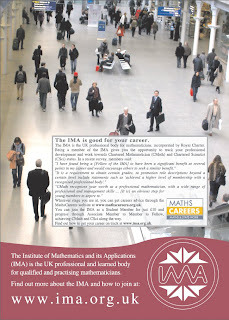 The second advert concentrates on mathematics careers. I originally had an advert drafted with a nice picture of Canary Wharf from across the Thames at Greenwich but in the current climate I wasn’t sure that was an attractive picture to use. Every time I see Canary Wharf on the telly it is being played over a bad news story! So just before the advert was due I was passing through St. Pancras Station in London. I stood on the upper level for a few minutes until I had to leave for my meeting and took a few photos. I tried to choose one with a mix of people looking like they’re off to work. The advert is below, click on it to see a larger version. I have designed adverts to go on the back cover of iSquared Magazine in the next 4 issues. Each highlights an aspect of IMA membership and will provide a regular income to support iSquared, something the IMA are keen to do. The first advert concentrates on recreational mathematics. The advert is below, click on it to see a larger version. Unfortunately the version in the magazine contains printing errors (some misaligned text). The IMA have received an apology from iSquared and we are working to make sure this doesn’t happen next time.